A staff member is a member of your company that has limited access to your company and customer database. They only have access to the information and tools required to do their job properly. Staff members can be upgraded to an administrator or manager at anytime (and downgraded as well). Staff members login to the same dashboard you as an administrator do; however, it is a significantly more limited view with much more strict permissions enforced. Staff members have access only to the clients that they have at least one scheduled event for. This prevents sitters from getting access to your companies entire client database. Staff can view contact information for the client and send them messages through the Conversation view. They can also see their service history but not any of the client’s financial information including invoices. Staff members can access the client’s pet information (and update it). They can also upload documents for the client and see previously uploaded documents. They cannot schedule new services for the client. Staff members can see their own schedule (i.e events that they are assigned to). They cannot modify the time or details of their assigned events, but they can see these details. Staff members can request time off. 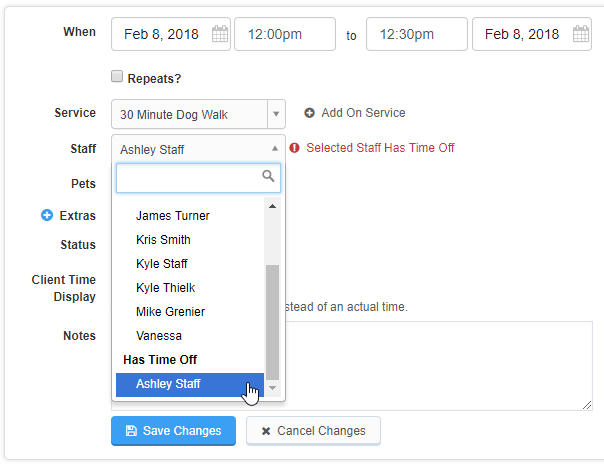 Staff members that request time off will be shown as unavailable if you attempt to schedule them when they have requested time off; however' as the administrator you can still override the request. 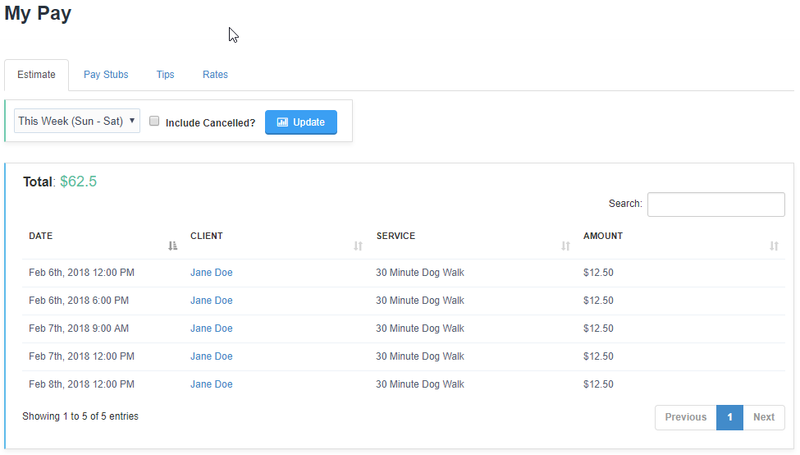 Staff members can see any pay stubs that you have generated for them as well as how much they are paid for each service they perform. Staff members can edit their own contact information and update their password. They can also turn off notifications for certain events. Locate the staff member in the list and click their name. Click on the blue "Quick Actions" button and click “Edit John Doe” where John Doe will be their name. Scroll down to the bottom and find the drop down labelled “Role”. Modify the access and click the button labelled “Update Staff Member”. 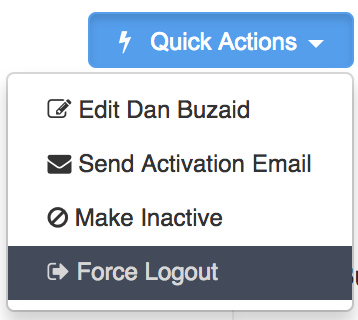 Force Logout is an additional security measure for staff that can be found under the "Quick Actions" menu. This will log the staff member out of Time To Pet on all of their devices.